Krystal and I really lucked out with the weather on our London trip – it didn’t ever rain while we were there except for our last day. A few times we took our umbrellas and hats just in case, but we didn’t ever actually have to use them! London is one of those cities where you just need to carry some rain protection or at least have it handy – I figured this was a good enough excuse to pick out a new hat before my trip! Because winter white is my favorite, I picked up this one from OTTE NY – isn’t she a beauty? Now that I have hats in black, burgundy, gray and winter white, I think I’m set for the season. Remember my fur collar from OTTE that I purchased a couple years back? It’s back again this season! I’m also loving this style. Click here to check out all of OTTE’s hats and fur accessories! I also wanted to mention a few sales happening right now that you definitely don’t want to miss. Enjoy 20% off site wide at AllSaints this weekend! Save on cool staples like this jacket, this cozy sweater (and this one – love the cutouts!) and these boots when you enter code NOVEMBER at checkout! Also obsessing over this jacket. Sale ends Sunday. Take 25% off all dresses and jewelry at Anthropologie for a limited time. I’m loving these antler drop earrings and this tulle sheath. Shop the whole sale here! J.Crew is back with 25% off your entire purchase this weekend! Enter code SHOPNOW at checkout and save big on winter favorites like this colorful coat, this embellished tweed dress (also love this one!!) and these leather leggings. Finally, Kate Spade is giving you 25% off your entire purchase with code BEMERRY! My picks? This embellished LBD, these navy + black satin heels, this gold bow clutch, and this bow-adorned shirtdress. This cosmetic case and these glittering mules would also be great holiday gifts! PS – my first holiday gift guide of the season launches tomorrow! Be sure to subscribe to my email list so you don’t miss any of my gift guides! This hat is so pretty and feminine. perfect! That sweater is fabulous and what a darling hat. I love this hat. And that sweater looks amazing on you, lady! Have fun in London! You look so chic in this hat! I love the black and white minimalism. and I think I finally need to just purchase those booties! Love the light and dark contrast. It’s fun that your hat and shoes even match up. 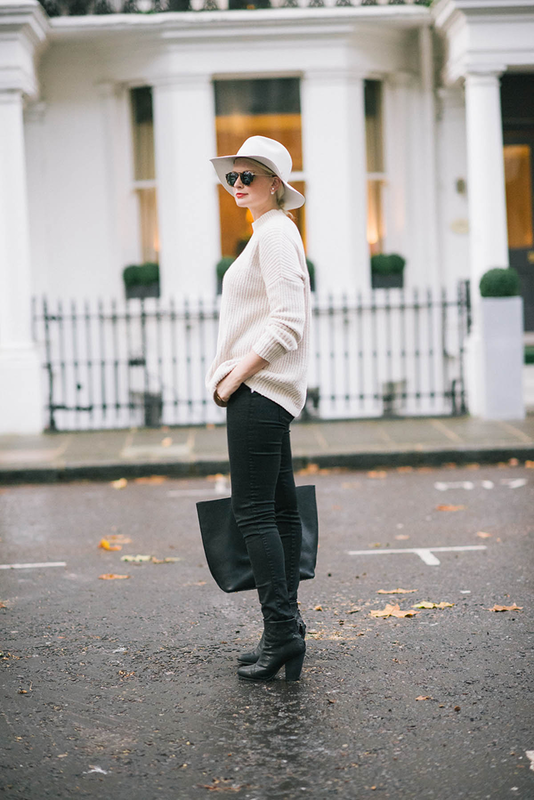 Love this minimal and timeless look! 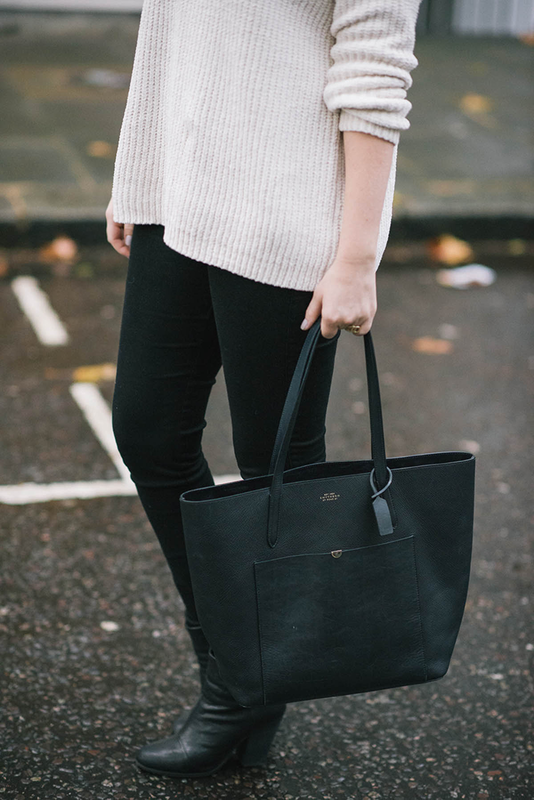 That Smythson bag is perfection! 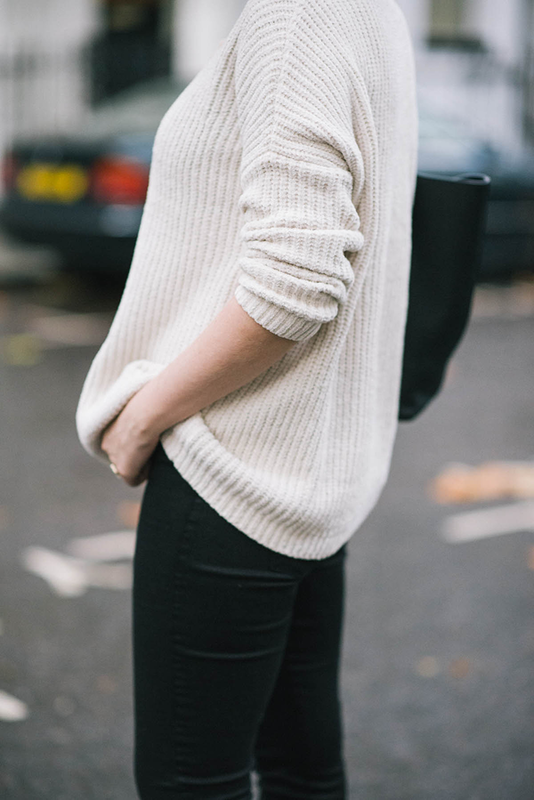 I love the simplicity of this outfit! Such a great and chic combo! I love the way you edited these pictures, they’re gorgeous! I love that first photo!! You look so beautiful. hats suit you! Love the white for winter. LOVING THE COZINESS OF THIS OUTFIT! You look so pretty in this white hat! Love this look! So casual and chic at the same time. 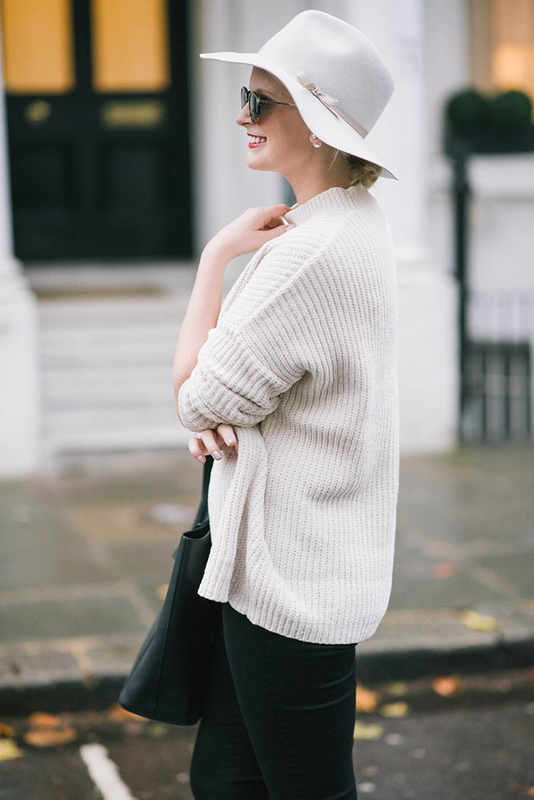 Winter white is definitely one of my favorite shades, such an elegant outfit! You look stunning! That hat is beyond perfect on you. Have a great weekend, Merritt! Love this! I’ll be shooting some fun winter white looks next week! You can never go wrong with this classic look! Love the sweater! What a great sweater! You can’t have enough of those this time of year!